Hello! I hope this message finds you all happy and well. I’m writing today to let you know that the pattern I mentioned to you way back in November has finally been published. Yay! I am so pleased to share with you all the details of this super-cute crochet toy. Last fall, one of my dear friends, Becky (who you might remember from our croshades adventure down Pearl Street) welcomed her first born into the world — a baby girl named Claire! Long before Claire was born, I was dreaming up a fun gift for her. Becky is one of the most colorful people I know. We have so much fun together that just thinking of her makes me smile. She cheers me up on a regular basis. I knew that this present for her new daughter should be just as cheerful and colorful. My favorite thing about this piece, aside from the cute amigurumi characters, is the variety of stitches and textures used. The wall hanging itself is worked in a chevron pattern, which I always find fun to do, and it gives the background a playful texture. The tree trunk is crocheted in the back loops only to create ribbing that, combined with variegated yarn, looks like bark. (You may remember, I did something similar with the trees in The Big Acorn Race.) The treetop and leaf pockets are crocheted with a scallop edge, and the flower petals are created around a big buttonhole so that children can pop them onto oversized buttons on flower stalks and in the tree. With so much going on in this wall hanging, the little ones won’t be able to resist everything there is to touch. The pattern will be released in three parts over the course of three issues in the digital magazine I Like Crochet (accessible through subscription). The first part covers crocheting the background including the tree. In the second part, we crochet the birds. 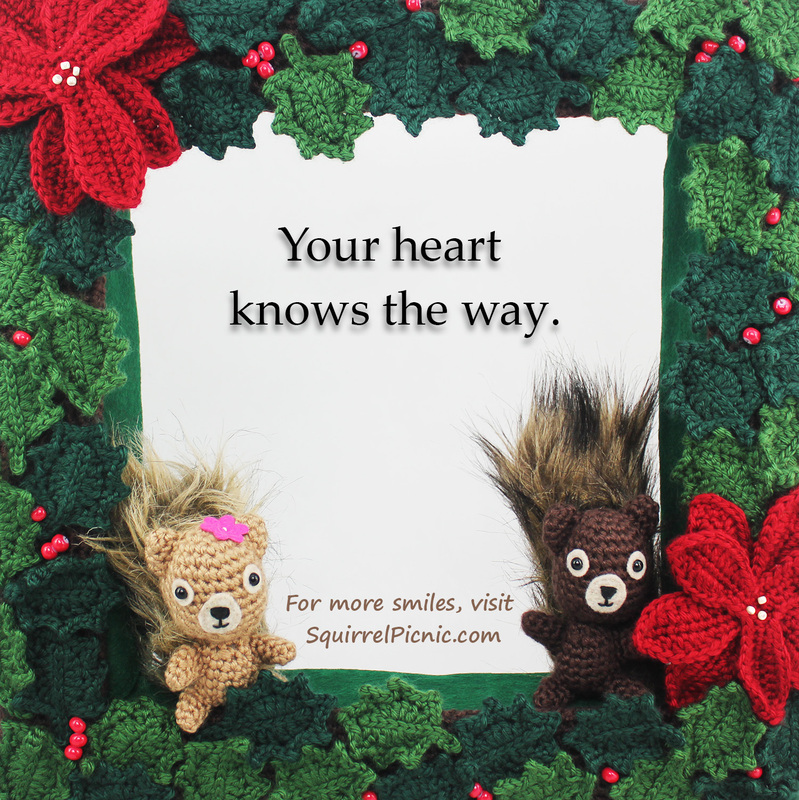 And in the final installment, I go over how to crochet the squirrel and flowers and finish the assembly. Until then, I hope you enjoy making a “Tree Full of Friends” for the kid in your life. I know I can’t wait to go over to Becky’s house and play with Claire and her new toy. 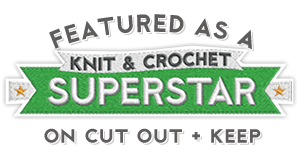 Categories: Crochet It | Permalink. I hope that you are doing well and enjoying the season. Many apologies that I have been absent for so long, but over the past several weeks, I’ve had to step away from Squirrel Picnic to take care of some business. First there was the business of completing two big projects that will be featured next year in the magazines Crochet! and I Like Crochet. It was an exciting experience for me and I can’t wait for you to see these new patterns. There was also a matter of the heart to attend to. This year has been a challenging one for many of us. For me, it was marked by unrelenting pressure (from myself) and misguided ambition. I pushed myself beyond my limits to produce and market The Big Acorn Race while working full time and continuing to provide patterns and comics here on my blog. And while I have a lot to be grateful for and much to be proud of, I can no longer deny the fact that I am also completely and utterly burned out. Looking forward to 2017, I’m reluctant to make any resolutions or set-in-stone plans, except to say that I plan to follow my heart, care for the people I love, and simply be happy. After the bizarre and difficult journey of 2016, my mind, body, and spirit are craving some r&r. More than anything I want to be able to look back next December and remember 2017 as the year I found contentment. My new year’s resolution? Just keep it simple. In order to do this, I’m afraid I must step away from Squirrel Picnic for a long while. Thank you, everyone, for all the support and encouragement you have given me over the past four years. It has been a great honor to meet you all and get to know you better. Being a part of the crochet and blogging communities helped me to open up in a way that I never was able to before. Meeting fellow crocheters and designers and lovers of cute things from around the world helped me feel connected and not so alone. You have inspired me and challenged me to learn and grow, and I will forever be thankful for this experience. It would be hard for me to predict when you will hear from me again here, but if you’d like to follow my journey you’ll be able to find me on Instagram. And perhaps someday Hodge and Podge will return with new adventures and projects for you to enjoy. Until then, I hope you, too, find many opportunities in the coming year to do the things that make you happiest. Keep exploring your world, making new friends, trying new things, creating memories, and sharing your talents. Most importantly I wish you a year filled with love and plenty to smile about. Categories: Smiles | Tags: 2017, blogging, farewell | Permalink. Categories: Smiles | Tags: encouragement, follow your heart, inspiration, motivation | Permalink. Categories: Year of the Sock | Tags: crochet, crochet socks, Halloween, In the Shadows, October | Permalink. Categories: Smiles | Tags: Halloween, joke, riddle, roller coaster, skeleton | Permalink. 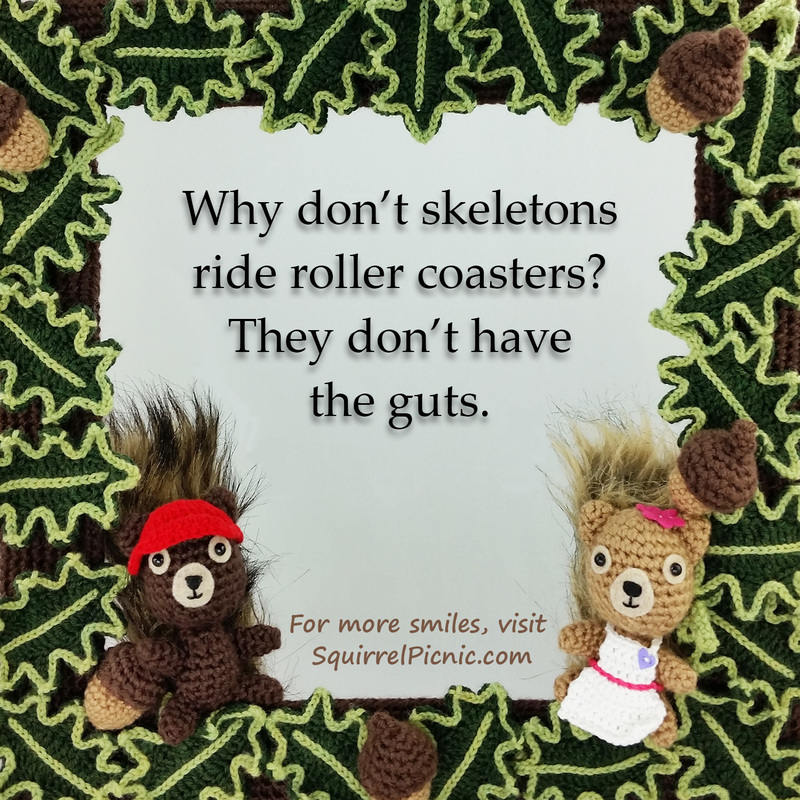 Celebrate Halloween with a free Squirrel Picnic web comic and pattern! Read “What’s That Noise?” and crochet the charming oompah band leader, Polka Bat, with this free pattern. 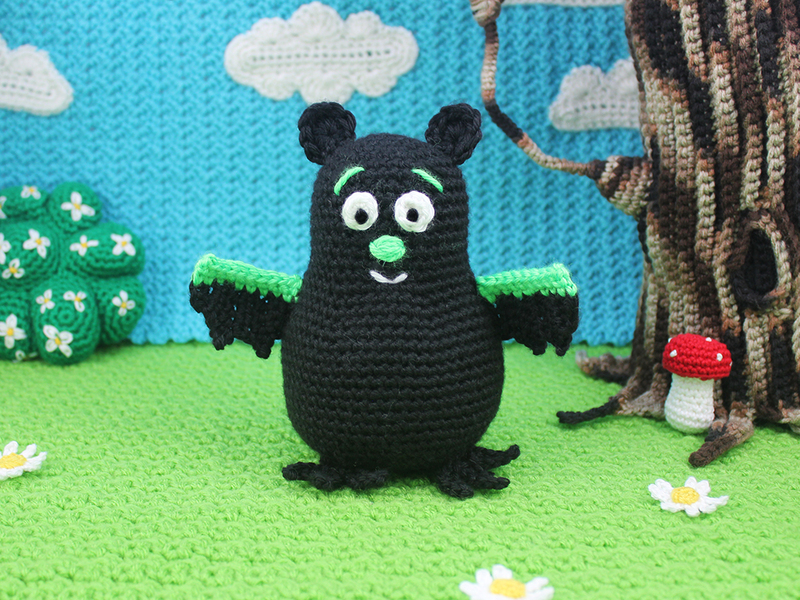 Categories: Crochet It | Tags: amigurumi, bat, crochet, Polka Bat | Permalink. Kara from Petals to Picots reviewed The Big Acorn Race on her blog today! In her review, she mentions that she and her son are enjoying the book together. It really touches my heart to hear this and it reminds me of how my mom and I loved to read stories together when I was a kid. It seems the best part about The Big Acorn Race is that it includes instructions to make the characters as well as many of the props and outfits so that you can continue their journey even after you’ve closed the book. I can imagine Kara and her son having many adventures together with their new squirrel friends. But the patterns in the book aren’t just for the squirrels! You’ll also find home decor and fashion accessory patterns to make items inspired by the story for you and your kiddos. Do you remember the Tall ‘n’ Fast Flower from the book? Kara chose some really cool colors for the one she made. You’ll have to hop on over to Petals to Picots and see for yourself!